My mother is Filipina – bourn and raised, only becoming a US citizen about 10 years ago. I grew up eating Filipino food like sisig, lumpia shanghai, adobong manok, sinigang na isda, and (my very favourite) dinuguan with fresh, cold puto. Oh, the memories! Very rarely would my mother make “American food”. When she did, it was usually Sloppy Joes on a toasted bun. I have no idea why, of all things typically “American”, did she settle on Sloppy Joes. I’m sure we had other American dishes, but that’s what sticks out in my mind. Either she made some labour-intensive Filipino dish, or Sloppy Joes. Not ready to tackle Filipino cuisine (all that preparation and palaver! ), I was willing to introduce a bit of nostalgia to my better-half who grew up in England and had never even heard of a “Sloppy Joe”, much less ate one before. Of course, being that we’re now (somewhat) vegetarians, we couldn’t possibly eat all that ground beef. 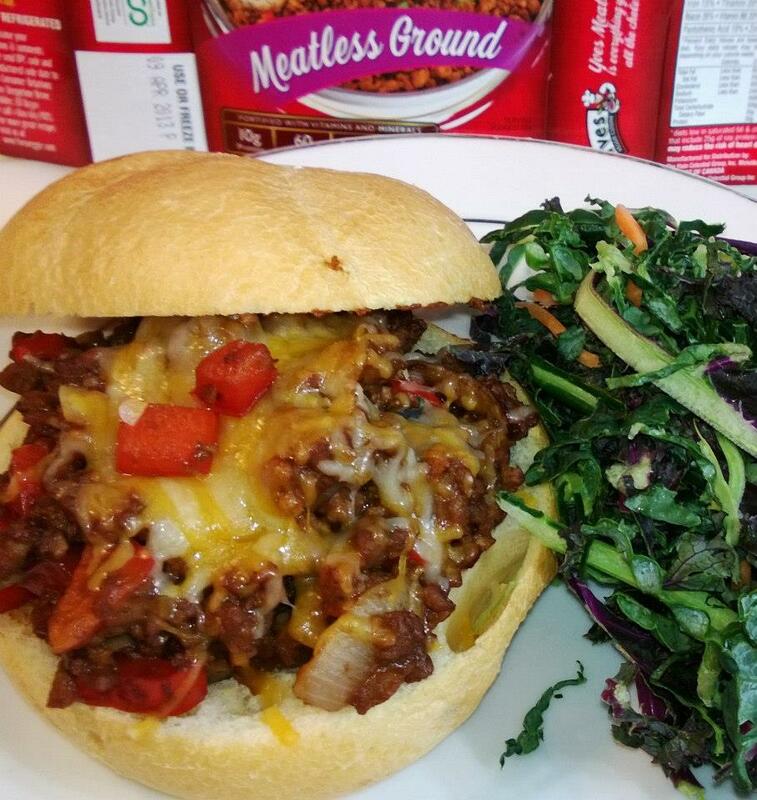 We had to come up with an alternative and Vegetarian Times had a great, easy recipe for “Sloppy Janes”. It was exactly what I needed. Childhood comfort food – just slightly different. We went for soy-based “veggie ground” (although we’re trying to go easy on the soy these days) and then I proceeded to add bell peppers (in place of the celery), onions, mushrooms, and we used brown sauce instead of bbq sauce. It was delicious with my vegan, almond pepper jack cheese and he used real cheese (he can’t stomach the fake stuff and since he doesn’t have the lactose-intolerance I do, there was no reason to subject him to my almond cheese – besides, that meant more for me). His cheese may have melted better, but I liked my pepper jack more – and, no horrible intestinal problems after dinner! Win-win in my opinion. The Filipino food will come, eventually. I just don’t know how I’m going to make vegetarian dinuguan. There is just no substitute for that. What’s your favourite comfort food? Do you still eat it? 🙂 You should definitely try them, sweetvegansoda! They were REALLY good! I mean, more so than I thought they’d be. This recipe is something we have as one of our standbys, now. I remember sloppy joes being in our dinner rotation as a kid. 🙂 I think pizza is my fave comfort food, but I’m gluten free and haven’t found a good sub–yet! Hi Coleen! Oooh, pizza! I think that’s my next entry…LOL We do get gluten-free when we can, but it doesn’t tend to bother me either way (yet, at least). Have you tried King Arthur Flour for the crust? I haven’t tried it myself, but I hear wonderful things all the time about it.